Nordic approaches to sustainable architecture is 1 week of lectures from the most brilliant Nordic architectural practices - combined with comprehensive workshops, design charettes and site visits to contemporary, Norwegian architectural masterpieces. At the Nordic approaches to sustainable architecture we discuss technology, sustainability and policies in the future urban environment. Shifting balances between urban and rural environment and development has made the impact of architecture and urban design greater than ever before. The designer´s role, however, tends to get marginalized for every new advancement in technology. The nordic approaches to sustainable architecture will demonstrate models for iterative and integrated design processes, methods, innovative ideas and cutting-edge concepts. Immerse yourself in the most brilliant minds of Nordic Architecture in the Unesco world heritage city of Bergen - the gateway to the fjords! You who are continuously involved and engaged in new, sustainable and green ideas and initiatives, or curious on how the Nordic approach to sustainable architecture works, are welcome to the Nordic Approaches to Sustainable Architecture 2018 at the Bergen House of Litterature 17.-21. September 2018! Tormod Amundsen (b. 1977) is CEO, partner and founder of Biotope. The company is based in Vardø and has 8 employees. Tormod established Biotope in 2012 together with his wife, Elin Taranger (b. 1968). 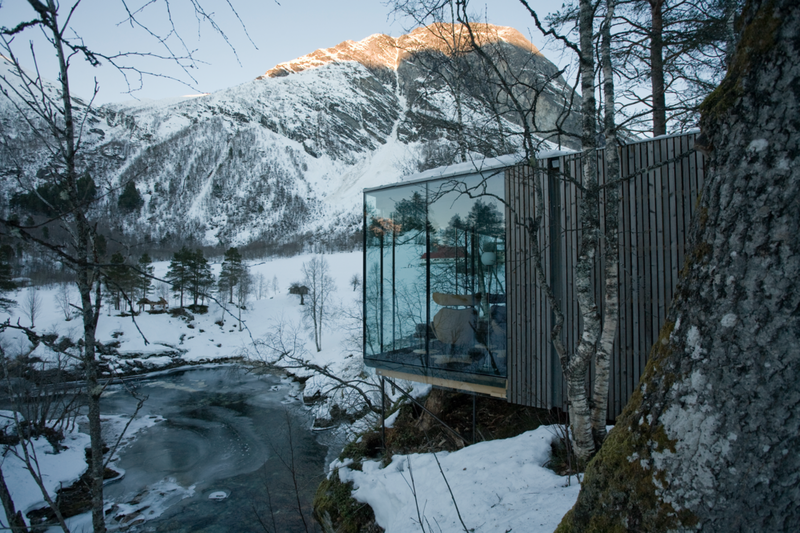 Biotope is the worlds first and only architectural office with special expertise on birds and birdwatching. They engage in pro nature projects. They design birdhides, shelters, nature trails, outdoor amphitheaters and much more. Biotope makes destination development studies, exhibitions and arrange workshops. They develop new concepts for experiencing nature and wildlife. Geir Haaversen (b. 1967) and Odd Klev (b. 1969) are the founding partners of A-lab. A-lab is most known for the Barcode project in Oslo and Statoils headquarters at Fornebu, Oslo. Haaversen and Klev founded A-lab in 2000, and the company today has a total of 8 partners. The company employs approx. 80 architects with a large variety in backgrounds, from designers to experts in sustainability, urbanism, technology and project management. The office is involved in projects spanning from urban design to smaller residential, museums, and design projects. Einar Jarmund (b. 1962) established Jarmund/Vigsnæs architects in 1996 together with his partner, Håkon Vigsnæs (b. 1962). The company is based in Oslo, and has 22 employees. Jarmund/Vigsnæs has received several awards, and their work is bespoke in several international architectural publications. In 1999, the firm was noted one of the 20 most promising young architectural practices in the world by the Wallpaper journal. In 2007, a large number of their works was exhibited during the architecture biennale in Sao Paulo in Brazil. Maria Beyer Skydt (b. 1980) is Chief Business Development Officer (CBDO) in Lendager Group. She has worked as Director of Business Development at Bjarke Ingels Group (BIG) in Copenhagen for 4 years prior to commencing her current position at Lendager Group in January 2018. Lendager Group is specialized in promoting circular economy within cities, buildings and companies of the future. Lendager Group offers an innovative approach to the dissemination of circular economy and the new business models that arise from this shift. They contribute to creating a future where economic growth is decoupled from greenhouse gas emissions. Håvard Haarstad (b. 1978) is founder of SpaceLab and a Research Professor at the Department of Geography, University of Bergen. His main interest concerns how to make resource and energy governance more democratic and sustainable. Tarje I. Wanvik (b. 1974) is co-founder of SpaceLab, and recently defended his PhD thesis on local effect of transnational corporate social responsibility. sPACE LAB WILL PRESENT Urban transformations: Cities are increasingly recognized as critical actors in climate and energy transformations. The way cities are planned and built is a key determinant for energy consumption and CO2 emissions, but also for other forms of sustainability. Reiulf Ramstad (b 1962) received Dottore in Architettura from Istituto Universitario di Architettura di Venezia, Venice, Italy. He established Reiulf Ramstad Architects (RRA) in 1995 in order to create an architectural practice that would turn conceptual research and practical knowledge into driving forces of sustainable design. RRA has earned a reputation for innovative architecture, displaying deep understanding of the uniqueness of every site and program and rejecting standardized solutions. Reiulf has worked with various types of project as both design architect as well as project leader. Dagur Eggertsson (b 1965) is an architect with a professional background from a number of the most prominent offices in Oslo. After his professional degree from the Oslo School of Architecture in 1992, he started his collaboration with architect Vibeke Jenssen, as NOIS architects. In 1996 he finished a post-professional master’s degree at the Helsinki University of Technology, where he started experimentation with building full scale architectonic objects, under the supervision of Professor Juhani Pallasmaa. In 2007, Eggertsson started collaboration with architect Sami Rintala, which resulted in establishment of the office Rintala Eggertsson Architects. The office is based in Oslo and Bodø, Norway. Eskild Andersen (B 1981) is new partner in Nordic architecture. specialises in large scale, high complexity infrastructure and urbanisation projects, with experience spanning residential, transport, commercial mixed use, as well as military projects. He was responsible for the architectural team designing the new 3,6 bn NOK passenger terminal at Bergen Airport Flesland in Norway, and several building contracts for the expansion of Oslo International Airport. Eskild was also responsible for the Bergen Harbour feasibility study, the “New Airport, New city” project in Bodø, and is currently the project architect for the ongoing masterplanning and transformation of the Laksevåg shipyard into a new urban district in Bergen. He is a part of Nordic’s internal professional advisory group, a much sought after speaker and regularly lectures at the Norwegian University of Science and Technology.